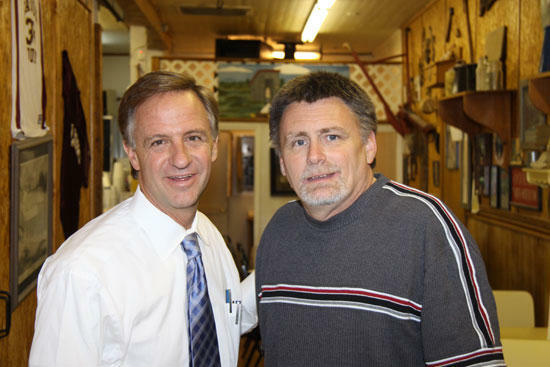 Knoxville Mayor Bill Haslam, left, meets Joe's Place owner Randy Barrett during this campaign stop here Tuesday. Putting Tennesseans to work will be the top priority for Bill Haslam if he is elected as Tennessee's next governor next year. The current mayor of Knoxville visited Joe's Place Restaurant on the Woodbury Town Square Tuesday for a campaign stop to introduce himself to Cannon County residents and voters and to listen to their concerns about the issues affecting both them and the state. "The biggest issue is jobs," Haslam said. "The state's unemployment is almost 11 percent and a lot of counties are way over that. No matter where I am across the state that is the thing people are concerned about, particularly in our rural areas where a lot of manufacturers have moved out." Haslam said creating jobs is going to be the largest challenge for the next governor of Tennessee. "One of the things we want to do is have a regional approach to job creation," Haslam said. 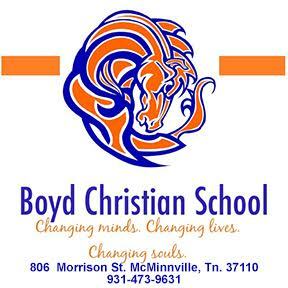 "People talk about the three states of Tennessee, east, middle and west, but there's really more than that because you have rural middle which is very different than urban middle so what you really have to do is literally go in and target regions, not necessary a specific county, because it might be a two or three county area in some cases, and come up with a specific strategy where you bring together local people and to come up with a job plan for their area." Haslam, a Republican, said that in traveling around the state he has noticed that each area and region has strengths that can be built on and developed in terms of creating or adding jobs. "The second challenge is we have a budget that's over a billion dollars in the hole," Haslam said. "We only made that up by taking money from the stimulus plan and the state's rainy day fund, but neither of those sources are going to be available for the next governor, so there's a thousand pound gorilla waiting on the next governor called a billion dollar-plus shortfall." Haslam said he expects Tennessee's current governor, Phil Bredesen, will enact some cuts in his final budget next year, but expects that the next governor will have to make additional reductions in state expenditures. The health care reform bill working its way through Congress could also add to Tennessee's financial burden, Haslam said. "The concern is the health care plan would cost Tennessee an additional billion dollars over the next five years," he said. The way that TennCare works is the state pays a third of the cost and the federal government two-thirds. If we expand rolls of who is eligible, the portion the state is responsible for expands as well. We are already in a hole with our budget, and somebody is wanting to dig it 100 yards deeper if that plan passes. Even Governor Bredesen, who is a member of the same party that is proposing it, calls it the mother of all unfunded mandates. Additional information about Haslam and his views on the issues that face Tennessee in the future can be found at his Web site, www.BillHaslam.com.